You are here: Hunting Dogs Supplies | Dog Collars | Prong Collars / Pinch Collars | Herm Sprenger Prong Collar - 22"
Herm Sprenger Prong Collar - 22"
Today's Coupons - Expire in 8 hours. Herm Sprenger Chrome Pinch/Prong Training Collar works great because it does not smash down and break the dog’s hair around its neck. This prong collar can have links added or taken out of it to make it fit your dog's neck appropriately. The ends of the prongs are rounded, not sharp to avoid cuts to your dog's neck. 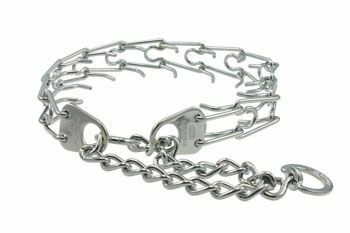 This Prong Collar is a steel collar that is chrome plated, which insures that there will be no flaking or rusting. Herm Sprenger is a German Manufacturer that makes the finest chain dog collars on the market. Pinch collars are for training and should not be left on the dog when not being trained. If fit properly and used properly, these pinch collars do not harm the dog. This is a heavy duty professional prong collar. If you are looking for a lighter weight prong collar please click here: Hallmark Prong Collar. To properly fit your dog, measure your dog’s neck and add 2 inches, the collar should be snug and fit high on the dog’s neck behind the ears. If used in this manner very little pinch needs to take place for proper training. This collar comes in 22” length.